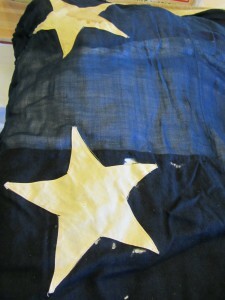 The Koenig flag was originally donated to Golden Landmarks Association in 1980 by Melinda (Koenig) Reed. The flag was first acquired by the donors’ great grandfather, Nicholas Koenig, who found it in the Loveland Block at 1122 Washington Avenue, after purchasing the building around 1883. The flag was in a burlap bag on the second floor. Upon Nicholas’s passing the flag was handed down through the Koenig family. First to Samuel Koenig, who passed it on to Carl Jacob Koenig Jr. around 1940-41. Carl would give it to his daughter, Melinda Koenig Reed. Subsequently, the flag was transferred to the City of Golden Collection in 2010. Koenig family history states the flag flew over the Loveland Block when the Territorial legislature was in session (the sixth and seventh legislative session were both in 1867). The flag was first displayed locally at the Golden Open House at the City of Golden Recreation Center on 10th Street, May 17, 1980. Other documentation suggests that Golden Landmarks Association hoped to raise money in support of some preventative conservation. It’s not clear whether anything was ever done. The flag has remained in storage for nearly 26 years. It was identified as a good candidate for a Greenwood Fund conservation grant in 2014. Prior to submitting grant a conservation evaluation was performed by Paulette Reading in August 2014. The flag was stabilized during the week of March 14, 2016 at the History Colorado Center. See many more photos of the Koenig flag in the GHM online collection.